The purpose of this TPO study is to develop a Master Plan for the Snapper Creek Trail Segment “B” from K-Land Park (SW 88 Street & SW 95 Avenue) to Dante Fascell Park (SW 88 Street & SW 57 Avenue), which is approximately 5 miles. The trail will ultimately connect community assets including the Dadeland North Metrorail Station, the M-Path/Underline, the Ludlam Trail, and the Red Road Linear Park. The overall Snapper Creek Trail was originally identified as one of the main corridors in the North Dade Greenways Network Master Plan, and a Master Plan for the Snapper Creek Trail Segment “A”, from the FIU Modesto A. Maidique Campus to K-Land Park, was prepared in 2008 as a result. Currently, no funds have been identified for construction of the recommended improvements. 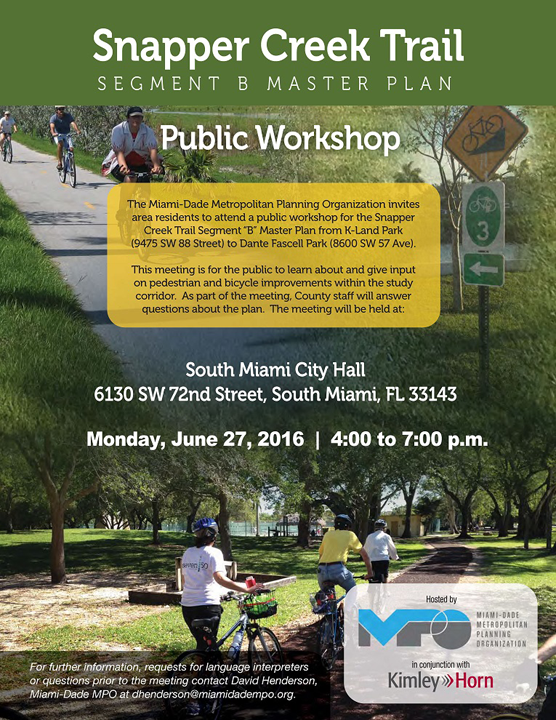 For more information please contact David Henderson at (305) 375-1647 or dhenderson@miamidadempo.org.